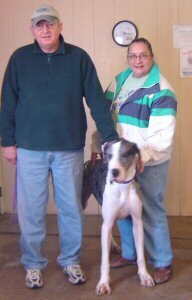 I am one of the Pickaway County Cruelty case Great Danes. I am a very sweet boy and can't wait to find my forever home. I am a very good boy and try my best to please. I am looking for a forever home that will appreciate me as much as I will appreciate them. If you do not like doggie kisses then I am NOT the dog for you! I love giving kisses and of course receiving them is great also!! Grandma says I am a real lover boy! ADOPTED: I found the forever home that most dogs only dream! Life is now wonderful! I am starting a new life so I got a new name, my new name is Toby!